Over time i've been posting about mystery locations with their unusual trademarks some of them I would really love to visit and some i wouldn't even dream of seeing talkless of visiting but altogether they are still unexplained mysteries of the world that deserves to be looked into, find plausible theories then a good reasons to them. I don't have the right equipments to investigate these events atleast not yet, soon though but for now I'll be summarizing them for you so now here's the summary story of the mysterious Loch Ness Monster a.k.a Nessie of Loch Ness, Scotland. Nessie monster is a cryptids of scotland being regarded by scientists as a phenomenon without biological basis saying the sightings even with the evidences ware hoaxes, wishful thinkings or misidentification of ordinary objects. This creature was brought to world attention on May 2, 1933 by Alex Campbell a waterbailif for loch ness and also a journalist for a Courier. August 4, on the same year George Spicer published a report saying he and his wife saw something which looked like a dragon or pre-historic animal he had ever seen in his life trundling along the roads towards the loch ness with animal in its mouth which was assumed to its prey. After few weeks the reports went viral, several days later letters started arriving to the courier some of them anonymous, claiming they saw this so called Sea Monster in water even sightings on land. As this news continued to spread across the media it adopted the names Sea serpent, dragon then finally settled with the Loch Ness Monster. December 6, that year Hugh Gray published a photography on Daily Express upon seeing the photo the state secretary of Scotland ordered the police not to harm the creature in any way if seen at all. The next year 1934 another evidence of this creature surfaced, a photo taken by a Surgeon. 1. Optical effects: In 1979 W. H. Lehn showed that atmospheric refraction could distort the shape and size of objects and animals and later published a photograph of a mirage of a rock on Lake Winnipeg which resembled a head and neck. 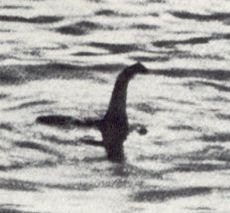 As i have listed some of the theories that made the Loch Ness monster unreal or not to have existed at all, the actual truth about this creature is still unclear cause these theories doesn't even have concrete explanations to them too. So here i am, clearly interested to what you think about this creature whether it was really a hoax, pre-historic animal, beast from another dimension or really one of theories from the researches.